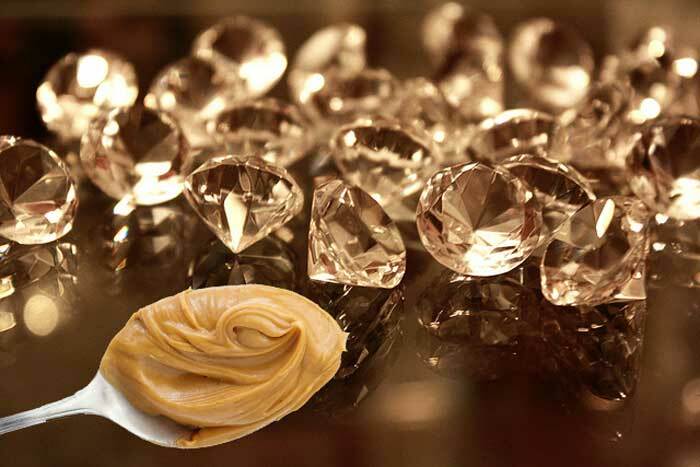 How To Make peanut butter into diamonds! Dan Frost, a research scientist at the Bayerisches Geoinstitut, University of Bayreuth, Germany, wants to know what’s going on in the Earth’s lower mantle, which sits 1800 miles below the surface and is somewhat of a mystery to researchers. He placed some peanut butter between two diamonds (this is called the “stiletto heel effect”) and compressed the nutty stuff. Why the diamonds? They’re incredibly hard and can withstand the necessary amount of pressure for the experiment, which is about 1.3 million times that of our atmospheric pressure. The result is a diamond where a peanut used to be, albeit a paltry and not entirely pure one.